Derek and I have spent the last 11 weeks training our puppy, Bradley, basic manners. After the first two weeks with our new puppy spending most of his time doing everything we didn’t want him to do and not seeing any signs of improvement, we called in the expert. After much research, we came across what appeared to be the best combination of services in the City. Jill Skorochod is owner of Time & Patience Dog Training Ltd. At the time we contacted Jill, Bradley was only 11 weeks old and had not had all of his immunizations yet so we couldn’t take him into a class full of other dogs. Luckily Jill offers in-home training, which is great for a number of reasons. For us, it was particularly beneficial because we wanted to focus on some of Bradley’s most annoying behaviors. In a classroom setting, there is little opportunity to work on specific behavioral issues without disrupting the flow of the class. The thing that was most comforting about our first in-home visit with Jill was that she showed us that our puppy had a brain inside that tiny head. We were sure during those first few weeks that Bradley was not capable of learning. He just seemed so young and distracted by the world that we didn’t think he could focus long enough to teach him anything. Jill taught Bradley multiple commands in the very first session. It gave us the confidence and comfort of knowing that Bradley would learn manners and in fact enjoyed learning. Teaching Bradley to follow commands gave him more focus and purpose, which contributed to many other behavioural areas that improved rapidly, including house-training, chewing furniture, and biting. Jill visited us three times over the following four weeks, providing advice and training for us and Bradley that is invaluable. By the time our private training was over, Bradley was not perfect by any stretch of the imagination, but he was a fun and lovable puppy that was learning good habits and dropping bad ones. Another huge benefit of Jill’s expertise early on in our puppy’s life is that by the time we started the first level of obedience, Bradley was way ahead of the game. Basic Companion is the first level of obedience classes that Time and Patience offers. It is a 5 week course, and the fantastic thing about Jill’s operation is that if your dog does not meet the standards which are required in order to pass the class, you can take the class over and over anytime you like for FREE! Jill offers this lifetime guarantee because she wants to make sure dogs around the City are well-trained. 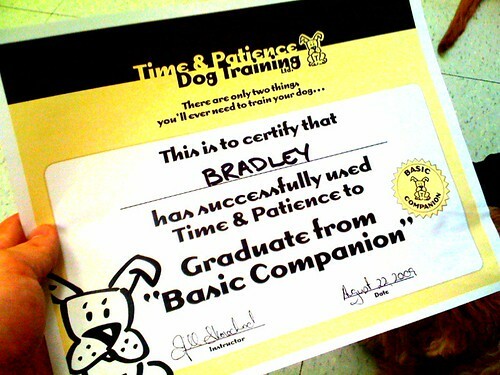 Yesterday, we were very proud puppy parents when Bradley passed Basic Companion! He still requires some work, particularly in the loose-leash walking area, but he knows what all of the commands mean and will usually follow the command with the reward of a treat waiting at the other end. As Jill describes dogs after they pass this class, we have a civilized dog and if we continue to work on all of the things we learned, he will be a basically good dog. However, we’re not after just a good dog. We want a great, off-leash reliable dog. And that is going to take many more weeks of training and homework. Luckily Jill will be there with the “Correct Companion” and “Off-leash Companion” classes to help us along the way. Time and Patience will be part of our lives until Bradley is as well-trained, and well rounded as he can be. Bradley loves the world, quite literally. He has loved every dog, child, adult, and even every piece of garbage he has ever encountered in his time with us…and we love him. He has a great personality, and he’s pretty cute if I might say so. His love of the world presents two obstacles for training. The first is that he’s so cute and lovable that we probably let him get away with more than we should. And the second is that he can become unfocused when we try and train him outside of the quiet of our house. Wheatens are high energy and stubborn as well, so this adds to the challenge. But we’re up for it, and I think Bradley is too. If the progress we have seen over the last 11 weeks is any indication of what’s to come, I have total faith.